We know readers tend to be writers too, so we feature writing tips from our authors. Who better to offer advice, insight, and inspiration than the authors you admire? They’ll answer several questions about their work, share their go-to techniques and more. Now, get writing! After developing an idea, what is the first action you take when beginning to write? My writing generally weaves together three strands of content. There’s some nugget of scientific research that I think is interesting and useful – maybe a study that I’ve just read about, or something which I’ve been wanting to write about for a while. Then, I also want to be clear on the practical advice that’s implied by that scientific insight. But there’s also the story or example that illustrates the topic. And my route into a new article or chapter can be any of those three; I start with whichever piece feels easiest and most exciting to get down on paper. When it’s the anecdote, I usually focus first on scraps of vivid language that an interviewee or client has used to describe a difficult situation. For the science and the advice, I will usually write in bullet points first – what my consulting colleagues used to call a “dot-dash” – to check the flow of the argument and ideas before I start investing in the bounce and feel of the language. Is there something you do to get into a writing mood? Somewhere you go or something you do to get thinking? Absolutely. One thing that really helps me is to put on large noise-cancelling headphones. They dampen ambient noise and reduce distraction, allowing me to think more clearly. But they’ve also become something I associate with really getting into deep thinking mode. As a result, simply putting them on sends a clear signal to me that I’m about to focus on my work – making it easier to dive in. (I write about the science behind this in chapter 3 of my book, for those who are interested!) And I’ve had three writing soundtracks in recent years. There was a period where the only thing I listened to was Haydn string quartets. For a long while, I’ve worked with a playlist of rather sparse and instrumental “deep house” music. (I think the two genres have a lot in common, but that’s for a different type of interview.) But sometimes nothing but silence will do. Did you always want to write? How did you start your career as an author? I always loved writing as a kid – especially science fiction, which I imagine was a surprise for my English teachers in the 1970s – and I was editor of my college yearbook and newsletter. I drifted away from writing as I built a career in economics. But after a few years, I had a job which was as much about writing as thinking: authoring the Bank of England’s Inflation Report. This was a publication analyzing and describing the state of the economy, so the writing was dry – yet I still loved it. And I learned many things that have served me well as a non-fiction writer. For example, the publication was so influential that bad syntax in a key sentence might end up moving financial markets in the wrong direction – so I learned the value of precision and clarity, and I learned what made a sentence easy or hard to read. (We even had to put our writing through a computer program to test the reading age required to understand it.) After reconnecting with my love of writing, I took every opportunity to write in real sentences rather than relying on PowerPoint slides. And once I’d written a couple of articles for the McKinsey Quarterly, I realized that it was time to bring writing back into the center of my life. That’s when I started work on the book, writing a four-page outline of something I wouldn’t finish for another four years. What’s the best writing advice that you have received? Lynda Gratton (Professor of Management Practice at London Business School, and author of 8 successful books) told me early in the process of writing my book that I would eventually need to make it my full-time job – at least for a few months. She was right; there really does come a point where you simply have to stop doing absolutely everything else, and say “right now, I am a writer, and my job is to write.” And her advice helped me recognize when it was time to disappear into the writing bunker. Meanwhile, Matt Lieberman (neuroscience professor at UCLA and author of Social) told me to look after myself physically while writing, reminding me to see exercise as an investment in my mental and emotional sharpness. What are three or four books that influenced your writing, or had a profound affect on you? At least four books encouraged me toward writing How to Have a Good Day. Predictably Irrational, by Dan Ariely. To see such a book capture people’s imagination made me excited that behavioral economics was coming of age. Moreover, I saw that it was possible to make academically rigorous material fun and engaging. The Happiness Hypothesis by Jonathan Haidt. I loved the cross-disciplinary approach of this wise book, drawing from psychology and neuroscience and even ancient philosophy. Also, my husband wooed me with it – it was the first present he ever bought me. Your Brain at Work, by David Rock. This put neuroscience in the context of the workplace, and it was the first book that I’d seen do that. Thinking Fast and Slow, by Daniel Kahneman. It was inspiring to see that such deep scientific concepts could excite a broad general audience. It helped too that I had heard him say that he’d found it tough to write the book. Since he’s a brilliant Nobel Prize laureate, that made me feel that it was okay for me to experience the occasional rough patch! And of course, it was all worth it. (I’m sure he feels that too.) 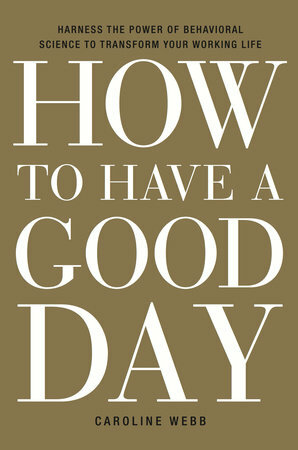 Learn about how to Have a Good Day here.